14.04.2016. Liverpool, England. 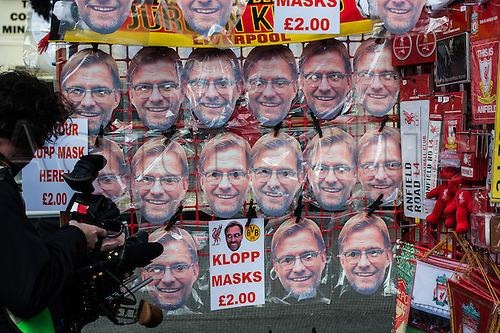 Posters with the face of Liverpool's coach Juergen Klopp are seen at a souvenir shop prior to the UEFA Europa League quarter finals match between Liverpool FC and Borussia Dortmund at the Anfield stadium in Liverpool, north west Britain 14 April 2016.